I am a really big fan of using different shades on my eyes to accentuate them. I like it when eyes are made to be the main feature of your face! As far as I'm concerned, they're built for it, who doesn't want all the focus on them? 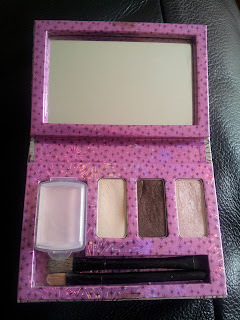 So while I know this product isn't brand new, it's relatively new to my collection, so I thought I would review it. I thought it would be a perfect addition, as it has all the shadows I need to create a full look for my eyes! In theory, this set is great, gives you all the basics you need and to be honest, while I prefer a gold/brown colour combo for this type of look, I was really drawn to the convenience of having everything (including brushes) in one place! Unfortunately however that is where my fascination ended. It goes on okay and is very easy to use and the brushes are fine for what you are doing. However the big problem is, it does not last. I am not even talking for the day, it does not last past a few hours. The colours are very neutral and for a day time subtle look, that is perfect. You do not however want something that becomes too subtle, in that it fades over (such a short) time. I also found that the pigmentation of the shadows was not great. 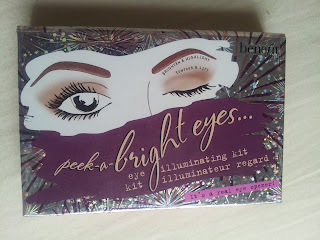 Overall I was very underwhelmed with this product from Benefit. In summary, would I re-purchase this product? Definitely not. It is not worth the money at all. I know plenty of lower end brands that last significantly longer than this and will revert to them in future. Have you tried the peek-a-bright eyes set? Let me know know what you thought. Have you any suggestions for an all-in-one eye set? I found your blog through Zoella's facebook post and you said you were just starting out! Just stopping by to say it looks great so far! Thanks for the feedback Rachel, glad you liked it! That's good to know. There's nothing more disappointing than creating a create look and having it fade right off your face.